Already superb at managing heat and moisture, naturally able to maintain an even skin temperature, how do you improve on bamboo fibre line socks? Well, take a look at our men’s SockShop Bamboo Mesh Trainer Liner Socks - they are extra-light, fine and woven in an extremely breathable fabric net, allowing even more warm air to escape, keeping hard-working feet cool and fresh in hot, sweaty training shoes. 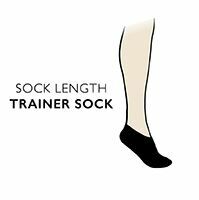 SockShop Bamboo Mesh Trainer Liner Socks are low at the ankle, with a slim upper cuff, so they also serve in you want that ‘invisible’ sock effect in many shoes. The socks come as a triple pack of mixed colour styles.